I booked my little boy’s first international plane trip before I even knew he was a little boy. It seemed like a crazy thing to do at the time, but booking a trip from Australia to Europe is kind of a necessity when your other half is German and all his family (naturally enough) will want to meet your new baby. Get your timing right. I consulted a few friends before I booked and around the four to five month mark seemed like the ideal time for a baby to travel – old enough that you, as a parent, have got the hang of things, but not so old that they’ve started moving around by themselves. Oh, and it’s also prior to that clingy stage where they don’t want anyone but their parents to hold them (which wouldn’t work too well on a “meet and greet the rellies” tour). Keep the trip in mind and get the baby accustomed to things that will help out on the trip – for example, I often carried my baby around in a baby harness knowing that this would be particularly handy both in airports and in the cobblestoned streets of Europe where prams wouldn’t travel well. Feed the baby on the way up and down in the plane. It can be a bit of a contortionist trick if you’re breastfeeding while the baby is strapped in to that extra seatbelt on your lap, but I can assure you it is possible. I saw a couple of other babies have a good scream during landing who weren’t being fed at the time – think of how the pressure feels in your ears and then imagine what it feels like to a baby who has no idea of what’s happening to them. Make absolutely, absolutely sure you have booked the bassinet seat in the plane. We didn’t have any trouble with this but a friend did, and I can’t imagine trying to deal with a long haul flight with a sleeping (or probably not sleeping) baby on my lap. If at all possible, travel with extras! My baby’s grandmother came along for the ride and having that third pair of hands actually made it something of a holiday for me, too. For example, the fact that a baby is usually entitled to a full quota of luggage (checked and on board) is great for all the stuff you’ll need, but not great because said baby can’t carry their own baggage so you’ve got a lot more to juggle. Have an angelic baby! We’re lucky to have a flexible, adaptable baby who slept about 90% of the way, dealt with stopovers with curiosity and grace, and only cried when he had a really good reason. 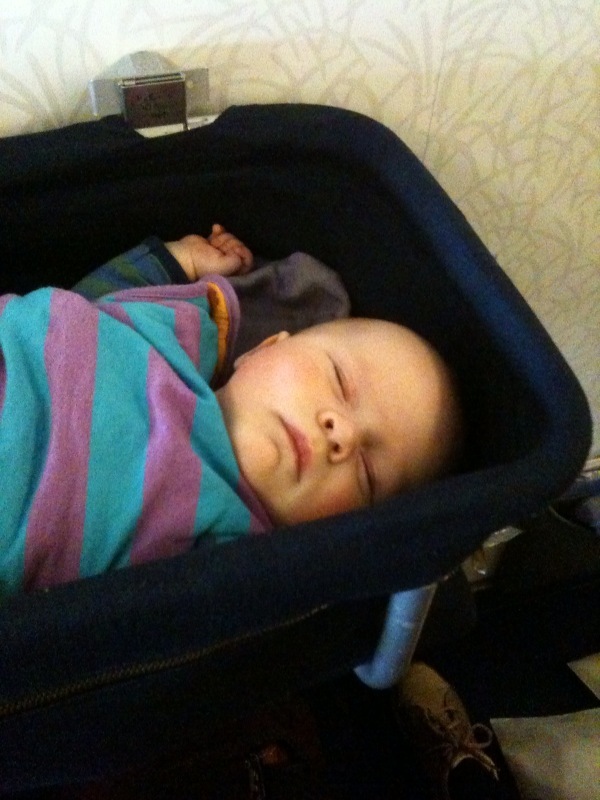 Of course, his journey in the bassinet was something like first class with the lie-flat seat while we were still stuck in economy – albeit with the extra legroom afforded by being in that bassinet row – so he’d actually had some sleep. Lucky thing. Great tips! I’ve never travelled with a baby. Our first attempt at plane travel occurred when Mr7 was two. That was early enough! Yes 4-5months old is perfect travel age. 16months is less so, believe me! I agree babies under 6 months, easy. Last month we travelled to NZ with our 18 month old. Only a 3 hour flight but tricky. You are a lifesaver. I’ve been worried about travelling with a baby but you make it sound fairly simple and nothing to worry about too much at all. I also read your guide to travelling with a toddler and I must admit I’m a little bit scared! Oh totally, Monica – the baby part is the easiest! Um yep … toddler time is not such an easy time to fly. Just from the time that they get mobile (crawl/walk) and before they are good at concentrating (eg on TV or iPad) … that’s a tricky one, at least for flights. OK once you get there though! But book a bunch of stuff for the baby time – it’s much easier than you’d imagine!